Emergency services are dealing with a road accident involving a car and a motorbike in Stirling. 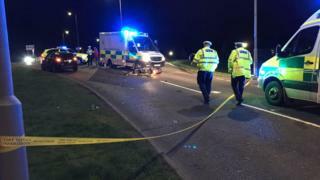 Police officers and ambulance crews were called to Drip Road, near Sainsbury's, shortly after 19:30. A spokesman for Police Scotland said the road was closed while inquiries were being carried out. It is unclear whether anyone was injured in the collision.